The Nestor Hotel provides a delightful leisurely atmosphere with friendly staff, high standard of food and service. Just a two minute walk will bring you to the nearest sandy beach and although peacefully located all the bars, restaurants, shops and night life. We have just returned from a most enjoyable week in the Hotel Nestor. It got off to a slightly stressful start, when, after arriving at 2:00am in the morning, we were given the keys to a room which had an interconnecting door with another room adjacent to it. The occupiers of this room had their telly on at almost full volume! The night receptionist said that the hotel was full, but that they'd look at moving us in the morning, but she got them to turn down the volume a bit in the meanwhile. Things got better after this, and we found the hotel to be very clean, well-run, and had very good food. Its in a great location,as others have mentioned, and the town centre is only about 5-8 minutes away. But, you can't hear the clubs and bars! We particularly found the food to be good, especially at evening dinner, and the service from all the staff was second to none. [Our special thanks to George in the restaurant, here!]. We didn't partake of the hotel entertainment, as the room for it seemed pretty empty most evenings,but when you venture outside into the town, you can see why, as there's lost to do out there.It must be hard to compete with that. We did 2 trips whilst there - one to the water park, and one to the Troodos mountains.Both were good days out. 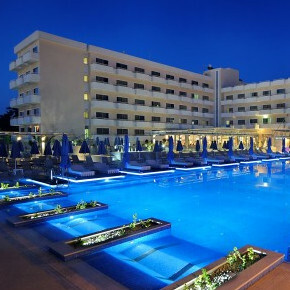 We would definately recommend this hotel to others, who wish to stay in Ayia Napa,and would also stay there again ourselves, with a good heart.Its a good 3 star, and the food and staff are as good as you would find in many of the 4 stars we've stayed in, elsewhere. Book the Nestor with confidence. My wife and myself thought that we were a little mature to visit a resort like this even though we are young at heart, but believe me there were older people than us at the nestor. The hotel is unbeatable cleanliness, choice of food, location and the staff were fantastic.the only down side of the resort and not the hotel is the amount of noisey eastern europearans,russians, as the germans have been over run by them. would I go there again, yes as i have been to 6 star hotels and they have been not as good as this. We stayed at the Nestor on half board. The food was fantastic on an evening there was loads of choice and a different theme each night ie italian,cyprian. Our room looked over the beach and harbour which after listening to other guests is better than pool view as some heard noise from some of the bars on the main road.Theres no need to take hairdryer and they have 3 pin plugs. The cleaners came every day with clean towels. Oh and aircon is ace. The hotel staff are the best ive seen they are so polite, funny esp George we got a kiss and a hug when we left. We saw some of the entertainment and it seem ok.
we stayed in the nestor for 2 weeks bed and breakfast. our room was brilliant and had an excellent view of the pool / sea. the rooms were spotless and cleaned every day. we had 2 single beds and a fold down bed for our daughter. the breakfasts were great, they had all your traditional meats, cheeses, ham, fruit, cakes, waffles, omlettes, beans etc. the omlettes and waffles were cooked to order and tasted lovely. the pool area was great, loads of sunbeds and tables, really clean. it had a play area for the kids. Bar service was really good and the food was lovely - look out for George, i think he's the bar manager, he will look after you and make you feel welcome. entertainment was provided by a variety of acts from robbie williams to magic shows. overall this hotel is an excellent choice in a brilliant location. we will definatley stay again. everything about this hotel is great! pool is nice and warm, just like the staff. look out for george at the pool side bar he is fantastic! heard no noise from ayia napa despite the entral location. rent quad bike from hotel for 55 euro for 3 days, well worth going to cape greco on it. the yellow submarine trip is 10 euro adults and 5 euro for kids, it is the best out of all of the boat trips, i know i went on them all! cyprus itself is a little pricey, avoid seafront resturants as they are expensicve. theres always pizza hut, burger king etc. The Nestor Hotel is fantastic, should definitely be a 4 star instead of a 3 star! We only stayed B&B but the breakfast was nice, lots of choice - sausages, bacon, beans, scrambled egg, cereals, hams, cheeses etc along with juices, coffees and teas. Around the hotel itself was kept very clean no messiness what so ever and cleaners did a very thorough job of our room every day, clean sheets and towels. Location was great - about a seven minute walk into the centre, turn left out of the hotel past the Crown inn and take the path as a shortcut, far enough away from the noise of the pubs and clubs. I thought staff were lovely. Reception staff friendly and spoke some english, man on late at night was funny, when we were waiting to come home at about 4 in the morning some people came in being a bit noisy and he made sure they kept quiet and even rang their room to tell them to be quiet, I thought was good as they make sure other guests staying there will not get woken up. Bar staff also very friendly, George was very nice and funny. We were always out when the entertainment started however saw it one night and there was a singer and a belly dancer on which was quite good. Water polo is on for about half an hour a day in the pool, games of pool, darts etc also organised. I thought pool was brilliant shallow at one end but sort of curves round and is 3 metres deep at the other end! This was the best hotel I have stayed in and would recommend it to anyone and am hoping to return next year! Good sized rooms, although now showing there age. Unusual in that the rooms are carpeted, and not tiled as per the norm in Cyprus hotels. The hotel is still using the old fashioned mechanical door key, complete with a 1kg key ring !!! Hotel was very clean and fixtures and fittings very nice, the public areas are tiled including the corridors outside the lifts and then recert to carpet which looked in good condition. Unusually the bedrooms were also carpeted and the soft furnishings were in good order. Bedrooms all had a balcony and we were pool facing which was lovely. There was a TV and a small fridge which can be unlocked and used for your own supplies at a charge. Lighting could have been better as it was quite a dark room with little adequate lighting available. Bathroom was small but functional and the shower very powerful and always hot water available. All in all the bedrooms were a good size and one of the largest I've encountered in Napa hotels. Food was a buffet affair as is the norm in Cyprus hotels. We were on half board as we got an excellent deal compared to B&B only. Breakfast was okay and there was good choice of food including, continental type breakfasts, fried English, toast and cereals. Coffee & tea available via a machine and the coffee was excellent. Evening meal again buffet style but sadly the food left a lot to be desired, the meat all seemed to be of cheap, fatty cuts as was the mincemeat used in the lasagne and bolognese on "Italian" night (evenings were themed every night) Much of the food was overcooked and dry and not particularly hot. We only took out evening meal once and didn't return again due to this. We did get a voucher for a lunch due to our late arrival on the first evening which we used and the lunchtime salad bar was very nice but again the hot section was very poor. Not sure if it was due to the fact it was the end of the season but one of our biggest complaints was the fact that a good 10-15 minutes before service was due to end be it breakfast, lunch or dinner the staff started clearing everything away and you literally had to chase them around for supplies if you wanted something else. We couldn't even get another coffee in the morning despite it being 10 minutes before service finished as they disconnected the coffee machine ! Very poor. Location wise the Nestor is perfect just far enough away from the hubbub of the main streets but perfect for the main beach and harbour area. Staff......mmmm not sure if it was the time of year i.e. end of season and they were disgruntled but they all need to go on a customer relations course ! Dining room staff were without doubt the worst and all were surly and unwelcoming. Reception staff were very polite but not overly friendly except the night porter and the bar staff were indifferent and didn't attempt to get to know us during our stay despite us trying our best. There was a singer on one evening and she was very good but we didn't see any others during our stay but I'm sure there's more during the height of the season. I would visit the hotel again but only on a B&B basis regardless of any offers to do half board, their are too many good restaurants anyway in Napa to stay in the hotel every evening aside from the fact the food was of poor quality. Good pool area and nice rooms but best of all and the main reason I'd stay again was the location.